KTMtwins.com KTM Motorcycle and Product News: 80 HP 690 Duke/RC8 you say! What? 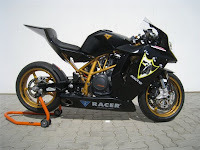 A 690 frame and engine with RC8 body and Suspension. Crazy. The Craziest thing about it is they are using KTM 690 performance parts that you can add to your bike.